Abstract: In the twelfth and thirteenth centuries women troubadours in southern France called trobairitz participated in dialogue or debate poems called tensons with male troubadours. 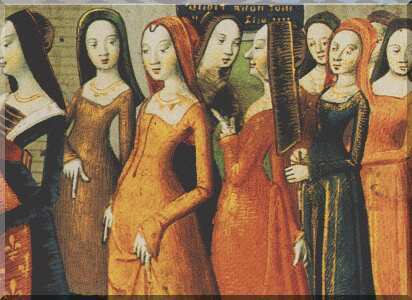 Of the nine existing tensons that include a male and a female voice, we will only analyze five tensons with the known identities of both the trobairitz and the troubadour that debate the subject of love, and we will include the following trobairitz tensons in this paper: Alamanda, Isabella, Garsenda, Lombarda and Maria de Ventadorn. We will discuss the thematic elements these five tensons share. Scholars such as Pierre Bec, Peter Dronke and Katharina Wilson note trobairitz’ themes vary from those of traditional male troubadours. Troubadours concentrate on the outward or social manifestations of the courtly love game and values, yet trobairitz focus on the intimate, private pleasures of love by deviating from generally accepted courtly love conventions and social behaviors. Since the subject of love is debated in these five tensons, the personal character in these tensons alludes to the trobairitz’s life – circumstances and incidents. A trobairitz’s personal character is also illustrated in the tenson by her willingness to show personal qualities about a love relationship and as Deborah Perkal-Balinsky calls it “a willingness to deviate from accepted social behavior or perhaps the rules of the game, in an effort to attain the intimate pleasures in a love relationship”. The tensons discussed provide valuable information about trobairitz and courtly love—the publicly displayed values of honor, valor and mercy. At times, trobairitz solicit love by revolting against the courtly love rules to win a man. In courtly love tensons, trobairitz use the literary style, courtly vocabulary and courtly values to express both their support and criticism for the system. Through the use of courtly vocabulary, trobairitz conform to the styles developed by troubadours, yet when trobairitz write as female lovers and poets, they also discard the conventions set forth by troubadours, since they are not male lovers and poets. In each tenson the literary mode is man-in-society, and the theme centers around love—either the praise of it or the blame from lack thereof or both. In each of the five tensons, there are three common threads in the trobairitz love relationships: (1) in each tenson we see the personal character of the trobairitz; (2) we see them deviate from the accepted social behavior or the rules of the game; and (3) we witness that the trobairitz are usually unhappy with their love relationships. We will examine each tenson individually regarding these three aspects.